Absolutely nothing to complain about. Quiet, pool, so clean it literally couldn’t be cleaner, great breakfast. No good if you are looking to meet people or party but for couples, you’ll want to stay in bed all day and enjoy venturing out when you’re hungry. Super happy here, extended our 2 day stay by 4 days! Fantastic hostel in a great location (just a short walk to the main square). The place was beautiful and clean - both the rooms and the common spaces. Hands down the best breakfast set up I've ever experienced in a hostel - there was a fancy little place setting for everyone in the am and LOTS of breakfast foods! Staff were very very helpful. Wifi only in common spaces - this is a quiet hostel with more of a hotel feel, not a place to party and probably not great for meeting people. BUT GREAT! One of the nicest Hostal’s I stayed in, even a small pool to use! Great location close to the main square. Really friendly and helpful staff. Secure entrance and room cleaned daily. Breakfast was great and sociable, the only time though to meet people as it was quiet there - great to relax and get a good nights sleep but not if you want to meet other people. We loved our stay here. Great location from the main square, fantastic service at breakfast, a swimming pool and really helpful and friendly staff. A great place to relax and recharge for a few days. Nice stay here. Relaxed environment. Great breakfast and helpful hosts. Bed comfy. Beautiful place to chill out and relax. Feels more like a boutique hotel than a hostel, especially in the private ensuite rooms. Super clean and great breakfast and very helpful staff. The only downfall is the wifi isn’t great and the shower was only luke warm in our room. 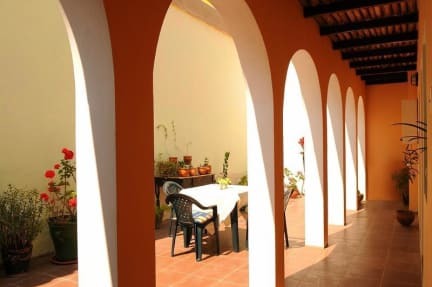 A nice quiet place to stay in Sucre. Good included breakfast. Nice internal courtyard to read/relax in. If you are looking for an upmarket hostel, this is it. The double rooms are like hotel rooms with a big bed and a TV. The rooms are clean and cleaned every day. The breakfast is good - eggs, a TINY piece of bacon, yogurt and cereal with coffee and juice. The staff are nice but not warm - more direct than chatty. Note: They do not have 24 hr reception so make sure you arrive after 7AM and before 10PM. The place is lovely, great location and swimmingpool and patio are great. low points: soap is just available, not even a shampoo. they do not re do the room, or change the towels. They dont accept cards, therefore is all cash.